Of the 1960s, Andy Warhol famously remarked, “It was the perfect time to think silver. Silver was the future […] And silver was also the past—the Silver Screen. And maybe more than anything, silver was narcissism[. ]” Though far from Warhol’s Pop sensibility, London, Ontario artist Jack Chambers was also “thinking silver” during this decade. Working with aluminum paint, Chambers found the means to explore visual perception and time, not to mention the ways that film and painting intersect and diverge. Silver paintings cannot be static: as soon as viewers move, the image shifts along a continuum from positive to negative. Similarly, what humans see is forever mutating and incomplete; our eyes reinterpret data as light changes and moves. With its enigmatic equations, Plus Nine has been interpreted as a meditation upon the human life cycle. 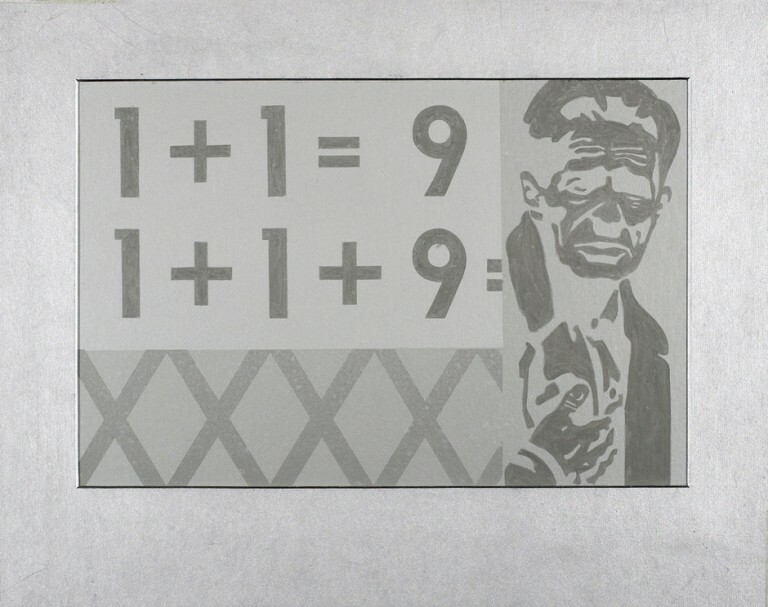 If “1” represents a beginning, “9” may represent an ending, the sum of these parts “equalling” an aged man. Chambers also explores this theme in experimental film of this period. By 1967, Chambers had moved to “Perceptual Realism,” painstakingly creating the images of London and his family for which he is best known today. His last film, Hart of London, was completed in 1970. For more information about this work/artist click here.